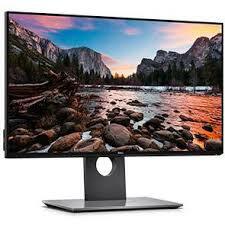 The Dell UltraSharp 24 InfinityEdge Monitor | U2417H takes your view to the edge with 45% less black borders than Dells previous 23.8 monitor. Optimize your view: Feast your eyes on the thinnest borders to ever to grace all four sides of a monitor. Dells InfinityEdge borders, which include the bezel width and inactive black space, create an almost seamless viewing experience. With 5.3mm top, left, and right sides and a bottom border measuring only 8.3mm.